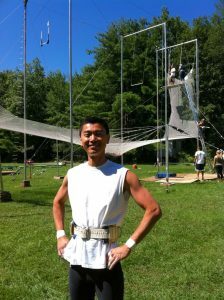 Justin Chien has been practicing Yoga for more than two decades. He started practicing Yoga as a way to relieve back and neck pain. He has been experiencing physical and spiritual benefits through his Yoga practice. He decided to become a certified Yoga teacher in 2004 to share the joy of Yoga with others. Why Stretch Therapy? As a long-time Yogi, Justin has been exploring an authentic progression of Yoga practice in the modern world. He found it! With the support from the creators of Stretch Therapy, Kit Laughlin and his partner Olivia Allnutt from Australia, Justin has gained an in-depth knowledge of this constantly evolving, empirical technique. Justin is honored to be part of the world-wide teaching circle for sharing this unique and effective approach, and apply it to the Yoga practice. Justin attended Kit Laughlin’s Stretch Teacher Training in 2009 to explore the Stretch Therapy system. Prior to that, Justin has studied Kit’s techniques through his publications, videos, and exchanging emails with him directly for several years. He finally met with Kit in person, and immersed himself to a deeper understanding of Kit’s techniques. To continue the education, Justin visited Kit’s training facility Monkey Gym in Australia in 2011. He also attended Kit’s Stretch Therapy Teacher Intensive training in London in 2017 and in 2018, surrounding by several talented teachers from all over the Europe. Justin’s openness and curiosity enables him to continually explore new and effective approaches. For example, he has experienced techniques such as Coach Sommer’s Gymnastic Bodies, Meridian Flexibility Stretching, and Muscle Activation Technique to broaden his knowledge in strength training, conditioning, flexibility, and body movement. Justin is compassionate, patient, and supportive of his students. He is actively involved in various sports such as skiing, running, and still a competitive adult figure skater coached by Olympic/World/National competition coaches Jane and Edouard Pliner from Russia. As a former engineering manager at Intel responsible for developing high-end micro-processors for 20 years and a Principal Program Manager currently at MathWorks, he understands the importance of taking good care of body and mind in a hectic world. He welcomes diversity in life and enjoys traveling around the world. He is eager to share his knowledge and assist others to explore the capacity within, both physically and mentally.